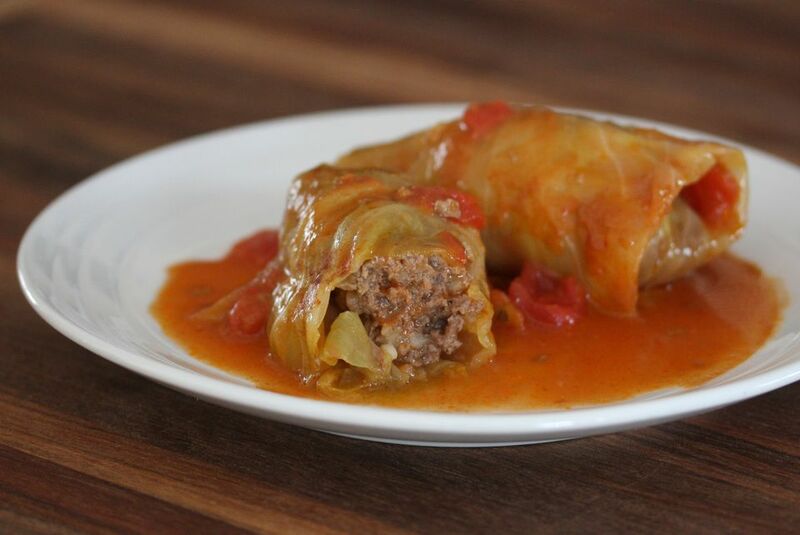 A touch of cinnamon flavors these family favorite cabbage rolls. Feel free to leave the cinnamon out or use just a pinch. This recipe is simple yet delicious. If you like lots of sauce—it's delicious over mashed potatoes—double the tomato soup and tomatoes. In a large bowl, combine the ground beef, rice, beaten egg, finely chopped onion, 1/2 teaspoon of salt, and 1/4 teaspoon of pepper. Mix until thoroughly blended. Remove leaves from the head of cabbage gently, taking care not to tear them. Scald the leaves in boiling salted water just long enough to wilt. Alternatively, place the whole head of cabbage in a microwave-safe dish with about 1/4 cup of water. Cook it on 100 percent power for about 12 to 15 minutes. The leaves should peel off easily. Place about 1/4 cup meat mixture in the center of each leaf; fold in sides and roll ends over meat, burrito-style; secure with wooden toothpicks. Place the cabbage rolls in the crock pot. In a bowl, combine the tomato soup, diced tomatoes, and cinnamon. Add salt and pepper to taste and pour the sauce over the cabbage rolls. Cover and cook on low for 7 to 9 hours. You can add the leftover cabbage leaves to the pot. Core the head of cabbage and place it in the freezer for several hours or overnight. Take it out of the freezer and let it thaw for a few hours. The leaves should peel off easily and will be soft enough to roll without blanching. These Stuffed Cabbage Rolls Never Disappoint! Make These Bacon Wrapped Hot Dogs and Watch Them Disappear!